For homesteaders interested in raising Angora rabbits for wool production, the show table, 4H, or as pets there's sure to be an Angora breed to suit you. Before you decide, it's best to research all of them and talk to breeders. It goes without saying that breeders love whatever they are raising in their rabbit barn. But if you listen to them talk about their rabbits, sometimes they will reveal a bit of information or clues that will let you know that the breed is right (or not) for you. Here's a closer look at the five main Angora breeds that are recognized by either the American Rabbit Breeders Association (​ARBA) or the International Association of German Rabbit Breeders (IAGARB). This angora benefits from daily grooming to keep the coat free of mats and debris, as it has more wool percentage than guard hair. This means that while they are gentle with children, they aren't suitable as a child's rabbit. Coat care is simply too great. They produce 10 ounces to 1 lb of fiber per year. These guys weigh in at 7 ½ to 10 ½ lbs and are the opposite of the English as far as wool/guard hair ratio. In this case, the guard hairs make up more of the coat instead of the undercoat, making the French a better choice for novice Angora owners and a dream for hand-spinners. The extra guard hairs (where most of the color is) allows for more intense colors in the fiber. That with the wooly undercoat offers what is considered the best halo effect on a garment. I've always been told that French Angoras naturally molt so the coat can be harvested by plucking. You couldn't prove that by my French line; I always have to shear them. This breed can produce up to 1 lb of wool per year. According to the ARBA (American Rabbit Breeders Association), Satin Angoras were created through a cross between a French Angora and a Satin rabbit. At 6 ½ to 10 lbs, the coat has incredible shine thanks to the unique quality of the fiber scales. The wool is dense and a pleasure to harvest. Spinners find it wonderful to work with because it’s easy to spin. This breed isn't one of the bigger wool-producers, however (about 1/2 lb of wool per year). 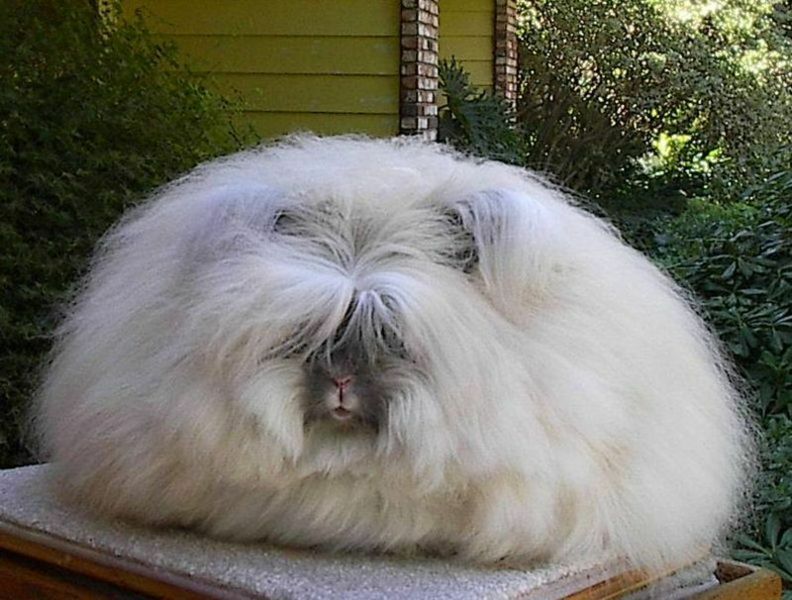 The largest of the angora breeds, the giant weighs in at least 9 1/2 to 10 lbs and are one of the highest fiber producers in the group (from 1-2 lbs of wool per year). While the Giant is of German decent the Giant and the German are, indeed, two separate breeds. The Giant was created by breeding German Angoras with other breeds such as the Flemish Giant in order to make a bigger rabbit. The only color recognized by the ARBA is white. This breed doesn’t ever naturally shed, so the wool must always be harvested by hand shearing. Often mistaken for the Giant Angora, Germans are not accepted by the ARBA, but do have their own association and shows through the IAGARB. This is the breed for major fiber production. They weigh from 7 lbs to 11 1/2 lbs and can produce an amazing 2 1/2 lbs to 4 1/2 lbs of wool per year! German Angoras resemble the English in that they have those irresistible facial furnishings (or tassels), albeit much less of them. Interested in Adding Angora Rabbits to Your Homestead? For more information on the English, French, Satin, and Giant Angoras, check out the ARBA website. For more information German Angoras, go to the IAGARB website.